The last few weeks I've been feeling sort of like a car that's been up on blocks getting a full makeover in someone's driveway. In short I've been getting all the medical work/checkups/tests/etc done that I've neglected for the last year while we were taking care of Fran. This kind of stuff does not necessarily put me in a great mood. I've been poked, prodded, x-rayed and compressed, so far so good, just a couple more checkups and I'm done for this year. Meanwhile we've been trying to catch up with the work we're supposed to be doing, celebrating Easter, and this weekend I'm throwing a birthday party for my dad. Most of the time my dad never got a birthday party for his very own. Sometimes, his birthday was on Easter or his anniversary, and just got overshadowed by other family celebrations. Also, Fran was never a big one for birthday parties. When asked her age she'd usually just answer, "I'm older than dirt". Happy freakin' birthday to you. So this is sort of a unique event. I'm trying to throw a genuine shindig. The way I calculate it, the compiled ages of all the guests puts us at something a bit short of a millenium. Never mind the Spotify playlist for this event, coming up with the menu for this is gonna take a bit of "creativity." With this crowd, imagine any food allergy or aversion that anyone you might know has and then multiply it by say, a zillion. There's the guy who can't have nuts and the lady who won't eat any green vegetables for a reason you just don't want to hear but she'll tell you anyway, most graphically. (Note to self: Can one make a Mojito with Metamucil?) Then there are the ones who won't eat salad, and the ones who will but only if it's got iceberg lettuce, something I think I haven't eaten since I moved out of my parents house. And then there's the lady who needs to sit on phone books at the table (Note to self: try and find phone books before this weekend) because she's very, very, very, short. So, while tallying the list of "dos" and "don'ts" for this party and trying to come up with a menu that makes everybody happy, I've been amusing myself with something that makes me happy, and that's a delicious Indian dessert. 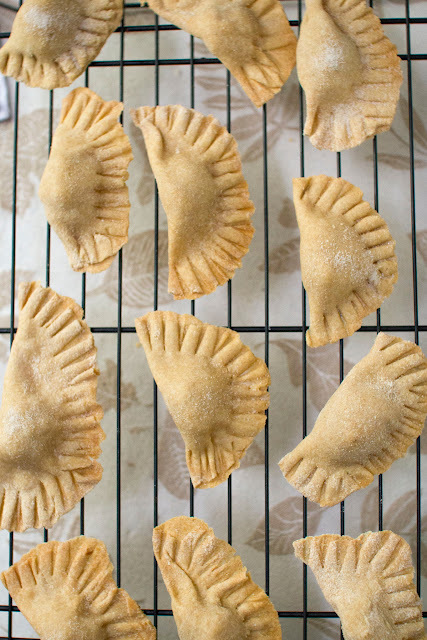 So last weekend I decided to make a batch of Gujia, the deliciously sweet little fried Indian turnover cookies traditionally served during the Holi celebration. Note, that these treats are traditionally fried. 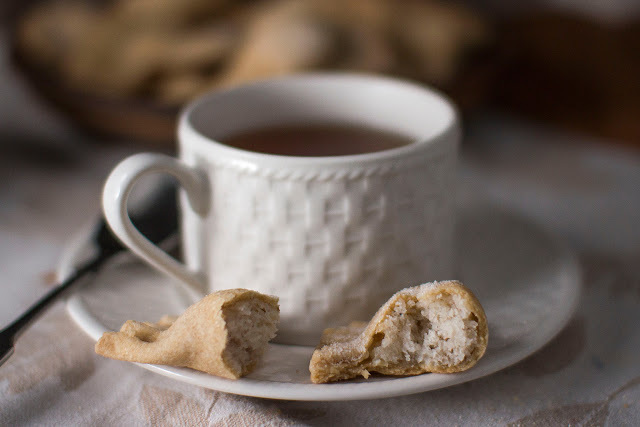 Fried, considering what I'd been indulging in at my birthday party the week before didn't seem like such a fabulous idea, so I wondered if these cookies could be made a bit healthier. When I went searching, I discovered that I wasn't the only one who wanted to Eat My Gujia and not Fry Them Too. A lot of people did. I was not alone. As it turns out there are more ways than one to bake a Gujia. Some people bake them, some people bake them then brush them with a sugar syrup. I decided to split the difference. I brushed the gujia with a bit of melted butter before baking and then sprinkled each of them with a pinch of sugar. Sweet, but not too sweet, just right. 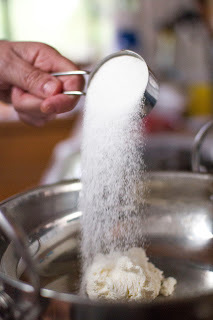 Mix the pastry flour, salt and semolina together. Rub the melted butter or ghee into the flour mixture. Add the water slowly, until you have a nice soft dough. 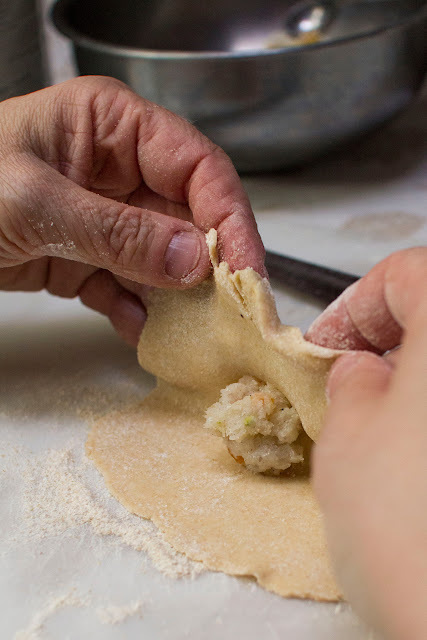 Knead it with a bit more flour until it becomes pliable and you can work with it easily. Put the dough in a bowl, cover it with a damp cloth and set it aside for about 10 minutes. In a kadhai or pot, mix together the ricotta, sugar and coconut. Heat the mixture slowly for 8 minutes or so, and keep mixing it so it doesn't stick. 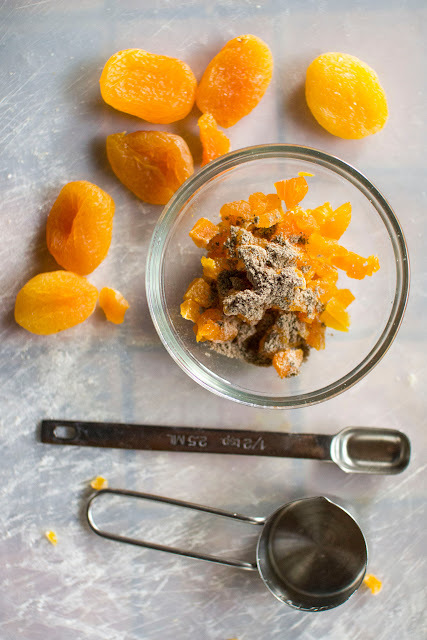 Take the pan off the heat and add in the apricots and cardamom. Cover a cookie sheet with parchment paper. Lightly grease the parchment paper. 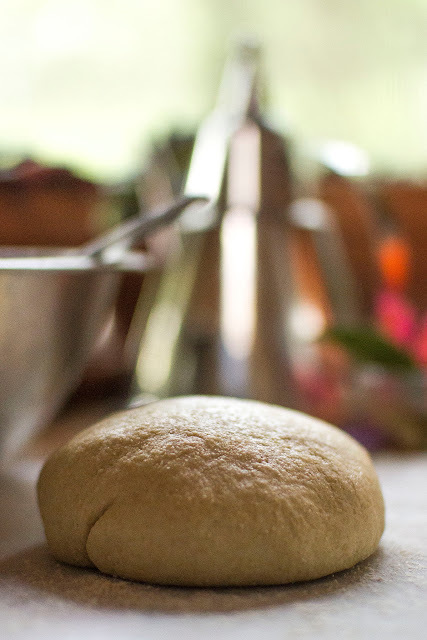 Roll each ball of dough into a small circle as though rolling chapattis. Place a tablespoon of the coconut, ricotta, apricot filling into the center of each circle. 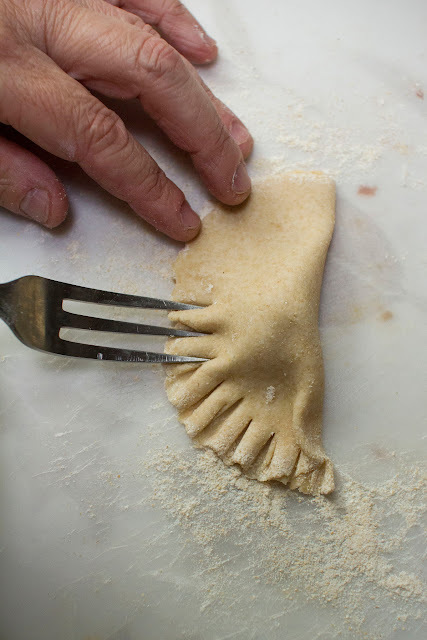 Fold the pastry circles in half. Seal the edges and press them together with the tines of a fork. Place the gujia onto the cookie sheet, brush each with a bit of melted butter and a pinch of sugar and bake them for about 10 minutes or until they turn a nice golden color. You may need to bake them a bit longer, depending on the speed of your oven. When they're done let them cool on a raised baking tray. Serve them up with a nice hot cup of chai. No, these are not fried and you will not get that crunchy fried feeling in your mouth. You will also not get that horrible guilty fried feeling in your gut after indulging. And yes, we indulged. 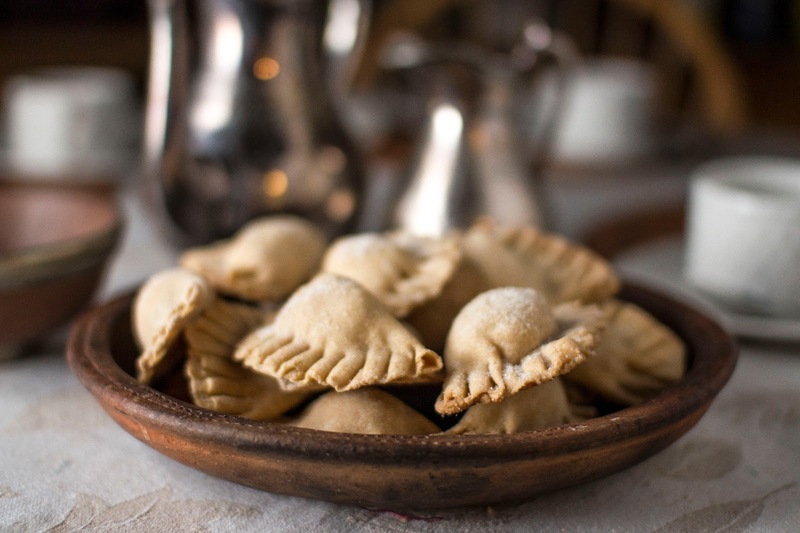 This recipe makes about 20 gujia, Next morning there were 2 left. Need I say more? What a lovely treat, sure to please the many palates! Wow - these look delicious. I haven't made gujjia ( we call them gughras) since Diwali. I usually fry mine but will bake them next time.